Glastonbury 2019 takes place at Worthy Farm and opens is doors to festival goers on June 26th - 30th June 2019. Tickets go on sale at the beginning of October 2018, we recommend registering for the advanced ticket sales. Do I need a Campervan hire pitch ticket? When taking a Campervan hire to Glastonbury 2019, pitch tickets must be purchased in advance; without a pitch ticket you will not be permitted to pitch your Glastonbury motorhome hire in the secure fields. The designated areas are the only place on the Glastonbury site where ticket holders can sleep in a Campervan hire. To purchase a Motorhome hire pitch telephone: 0844 412 4626. Before phoning make sure you have your festival ticket booking reference number to hand. Glastonbury 2019 Motorhome hire pitch tickets are not transferable. What facilities are provided for the Glastonbury Motorhome hire pitches? On site toilets, water and waste water points are available. The Campervan field is surrounded by a steel shield fencing and patrolled by security staff 24 hours a day. 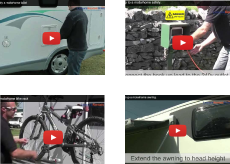 Do I need an electric hook-up for my Glastonbury Motorhome hire? Glastonbury campervan pitches do not provide hook up's, however all the facilities on a Motorhome hire work either from the leisure battery or the on-board LPG gas canister. Top Tip: running the engine every so often will replenish the leisure battery. Warning: Motorhomes also have a three pin socket, but this will NOT WORK. The three pin socket only runs on a 240v electric hook up. This means any 240v device will NOT WORK at Glastonbury. Does my Campervan hire have its own water supply? Yes, Motorhomes have an on-board water tank; the capacity is between 80 litres and 250 litres depending on the motorhome hired. Conserving the water is important. Top Tip: Avoid long showers; having long showers will deplete your motorhome hire water supplies rapidly. Instead Quickly use the shower to cover yourself in water and then turn it off. Lather yourself then switch the shower back on and wash yourself off. If you need to replenish the Motorhome hire on-board water tank then it's best to take a water roller and hose. We advise speaking to your Motorhome hire supplier regarding this. Will the toilet and shower work in my Glastonbury Motorhome hire? Yes, the shower and toilet run of the leisure battery and are supplied with water from the on-board water tank.